A few weeks ago on the Footbike Italy facebook page, Philippe Saumont said that he had enthusiastically kicked, in the ‘nineties, thousands of kilometers on a scooter called a Trocyclette, which was invented by his grandfather, Louis-Georges Bogrand – in 1944. In those few lines were too many interesting statements not to whet my curiosity, especially in reference to the history of the scooter. So I followed up to ask more about this story and discovered many interesting things. First, that there is a great site where I could research the story, Trottinette e-Zine, edited by Philippe’s friend Emmanuel Maurice and stocked with information about the world of scooters. I recommend you check it out because it contains many interesting curiosities. Going deeper, we discover that Philippe Saumont (facebook page Théâtre Des Tarabates), the author of the facebook post, in the ‘nineties completed some very noteworthy feats with the Trocyclette, news to most of us, and of which I had never heard. 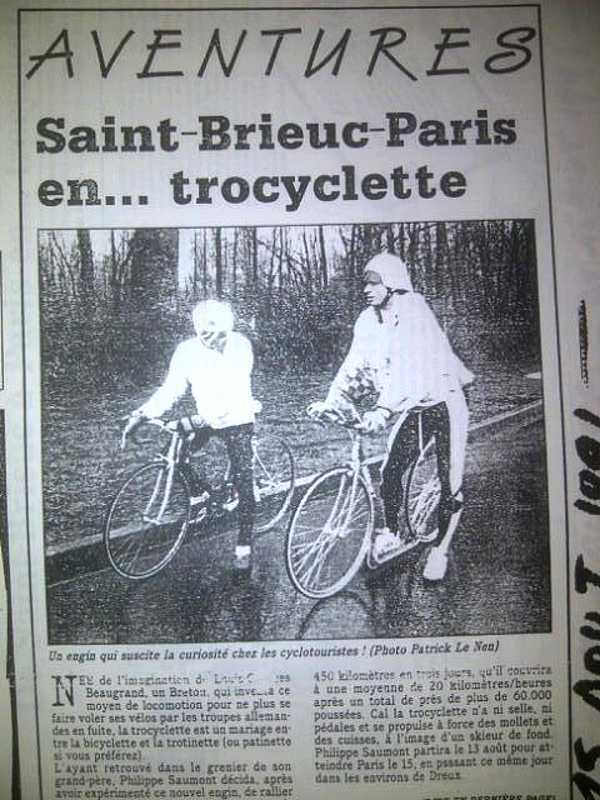 Philippe has kept newspaper clippings and video, some of which are available on Youtube, which testify to his expeditions of more than 7000 km on his grandfather’s Trocyclette, along St Brieuc in Paris (444 miles in 24 hours) and St Brieuc-Sevilla (about 2000 miles in 20 days). 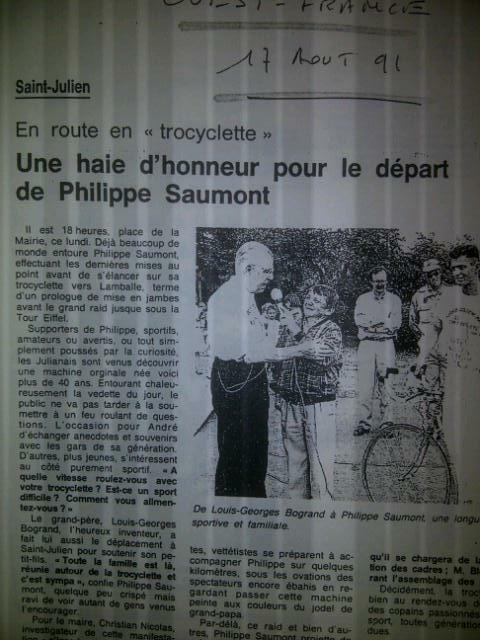 Philippe tried between 1991 and 1992 to publicize this “new” means of transport, the Trocyclette, and in addition to the aforementioned exploits, has participated in numerous television programs and been the subject of many newspaper and magazine articles. Philippe had found his grandfather’s Trocyclette, jealously guarded in a garage, put it back on track, and began to push the scooter not only for another 7000 km, but promoting its use by participating in many sporting events, on television, and by giving interviews to newspapers. 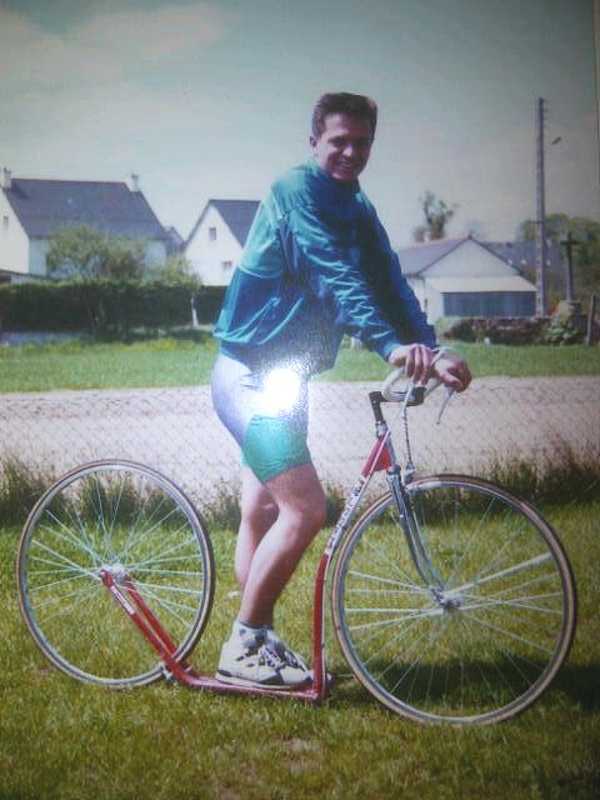 His efforts were not appreciated, Philippe complains, because after twenty years of activity, for a long time he was still alone in the sport, at least in France. Today things are changing, there is a growing movement in Europe and worldwide and we hope that the efforts of all like Philippe are recognized, so as we support the sport we should remember what his grandfather Louis-Georges did. 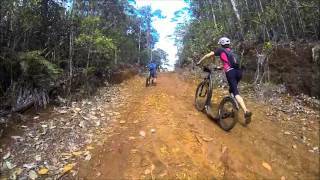 Philippe has not stopped there; he’s also patented a scooter, or rather a Trottinette Tout Terrain for some fun on all terrain, and is looking for a producer to support him in this adventure. The Trocyclette is a pleasant mix between a “scooter” and “bicyclette,” invented by Louis-Georges BOGRAND, a merchant, in June 1944. 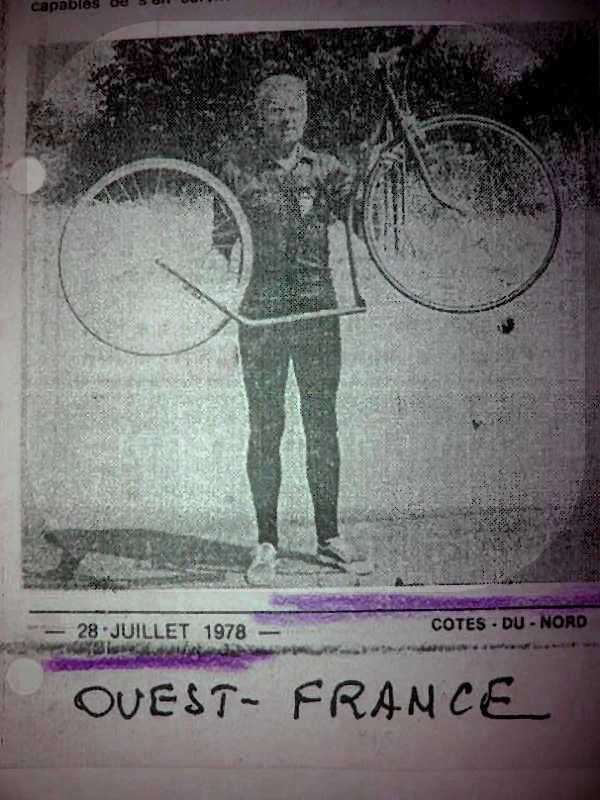 At that time St Brieuc in Brittany was under occupation by German armed forces, who were confiscating transportation, including bicycles, so Bogrand, to save his bicycle, his only means of transportation, hid it and took a scooter to return home. Unfortunately, the small wheels wouldn’t carry the distance. 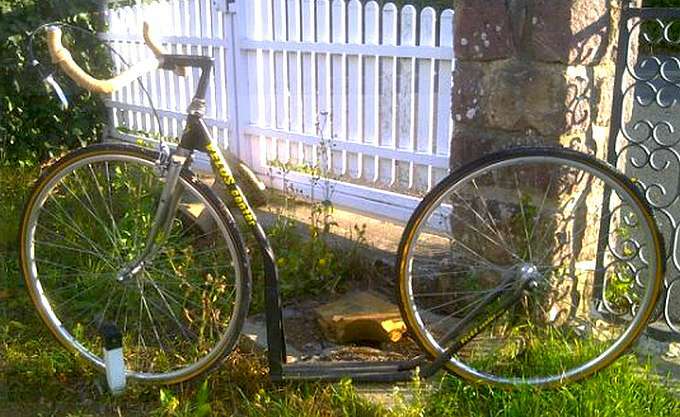 On the day after, he built a frame on which he could mount bicycle racing wheels, which in those days were made of wood. That evening he managed to return home at an average of 20 km/h. Thus was born the Trocyclette, a scooter with two big wheels, such as are popular nowadays. It was 1944. “Louis-Georges has always been a familiar character in the world of cycling in Brittany, since he was organizer of the Grand Prix de passage de la poste, without a doubt one of the most beautiful classic Breton rides” said a newspaper article found by Philippe Saumont. 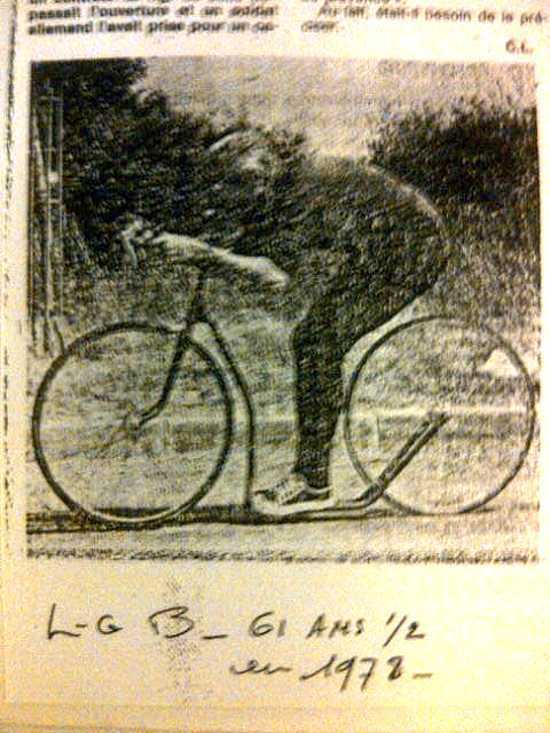 Louis-Georges, the journalist continued, “has never lost the enthusiasm and interest in the technological evolution of bicycles. 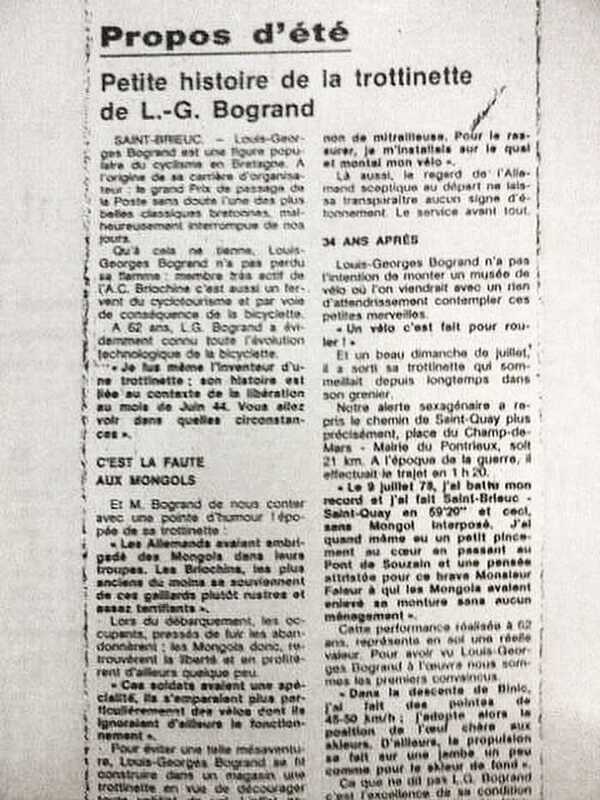 That passion and enthusiasm led him in 1944 to invent a new vehicle, a new means of transport, the Trocyclette, during the Liberation.” The interview goes on to describe the invention and express the spirit of Louis-Georges with his maxim “a bicycle is made “to ride, not to be put in a museum,” went on to report that on a beautiful Sunday in July 1978, 34 years after the invention of the Trocyclette, and, aged 61 and a half years, jumped on his invention and kicked the same route he used during the war. At that time he could do it in 1 hour and 20 minutes; on 9 July 1978 he managed to beat his record along the 21 km. Just look at the pictures below to see the Trocyclette is a modern 28-inch wheeled scooter with a low deck, which allows an aerodynamic riding position … so I think we can say that Louis-Georges Bogrand is the inventor and pioneer of contemporary footbike. 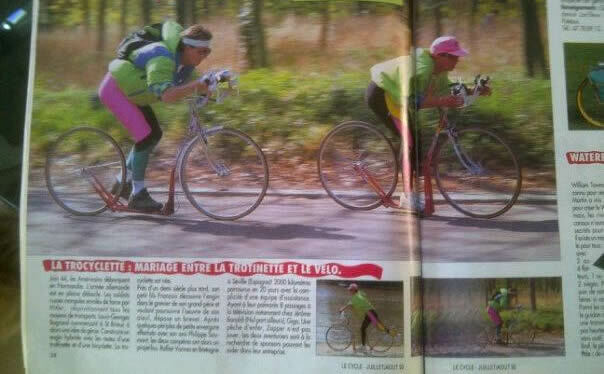 Congratulations and thanks to Philippe, who let us re-discover the Trocyclette! Read the original articles of the scooter and the complete e-zine here, here and here.